We’d love your help. Let us know what’s wrong with this preview of The Quest by Daniel Yergin. A master storyteller as well as a leading energy expert, Daniel Yergin continues the riveting story begun in his Pulitzer Prize–winning book, The Prize. In The Quest, Yergin shows us how energy is an engine of global political and economic change and conflict, in a story that spans the energies on which our civilization has been built and the new energies that are competin A master storyteller as well as a leading energy expert, Daniel Yergin continues the riveting story begun in his Pulitzer Prize–winning book, The Prize. In The Quest, Yergin shows us how energy is an engine of global political and economic change and conflict, in a story that spans the energies on which our civilization has been built and the new energies that are competing to replace them. To ask other readers questions about The Quest, please sign up. Can this be read stand-alone, without reading the Prize first? Sarah Yes, absolutely. I also haven't read The Prize, but I found The Quest a very accessible (and valuable) read. This is something quite extraordinary. A sprawling, epic story covering energy and its effects on policy, with characters and topics and events from the beginning of the industrial revolution to the death of Osama and the Fukushima nuclear disaster. Covers oil, the petrostate, war, electricity, the computer age, climate change, the new carbon economy, renewable energy, and what is to be done in the future. And all this in a very lucid and readable style. I would go so far as to say that the search This is something quite extraordinary. Some two centuries ago a profound economic shift upset the traditional relations of East and West. With the advent of the Industrial Revolution, Western Europe and the United States began to overtake the great civilizations of China and India, the planet's wealthiest and most sophisticated societies throughout most of recorded history. Now those two centuries of increasing imbalance are coming to an end, the result of the combined effects of five centuries of globalization beginning with Columbus; advances in transportation and communication in the 19th and 20th Centuries; the rapid spread of literacy, especially in the years following World War II; and major improvements in healthcare, which dramatically extended life expectancy across the globe. As the 21st Century continues to unfold, we may yet see today's wealthiest economies -- those of Europe and the United States -- fall behind the Asian giants, as they tap the potential of billions of increasingly healthy, well-educated citizens. This tectonic shift in geopolitical relations lends great urgency to energy politics today. The rise of the East is as great a factor in the sourcing and distribution of energy resources as climate change. Both factors loom large in economic researcher Daniel Yergin's superb new book, The Quest: Energy, Security, and the Remaking of the Modern World. In 1991 Yergin published The Prize: The Epic Quest for Oil, Money, and Power, which gained the #1 spot on the New York Times nonfiction best-seller list, won the Pulitzer Prize, and established his firm, Cambridge Energy Research Associates, as the country's most sought-after voice on energy issues. Two decades later, The Quest broadens and updates the earlier book, relating the monumental changes in energy markets wrought by technological innovation, historic geopolitical shifts, and our changing views of energy and climate. "Three fundamental questions shape this narrative," Yergin writes in the introduction. "Will enough energy be available to meet the needs of a growing world, and at what cost, and with what technologies? How can the security of the energy system on which the world depends be protected? What will be the impact of environmental concerns, including climate change, on the future of energy -- and how will energy development affect the environment?" Approaching the topic more specifically, he asks, "Will resources be adequate not only to fuel today's $65 trillion global economy but also to fuel what might be a $130 trillion economy in just two decades? To put it simply, will the oil resources be sufficient to go from a world of almost a billion automobiles to a world of more than two billion cars?" Later the author emphasizes the significance of this question: "Despite growth in emerging markets, one out of every nine barrels of oil used in the world every day is burned as motor fuel on American roads." The Quest is a big book, gushing with information. Yergin surveys virtually every significant aspect of energy in today's world. He touches on every energy source, every significant energy-related technological development of recent decades, and every major location of energy resources, and he briefly relates the history of each element. For a nonspecialist, The Quest is an immersion course in the nature and politics of energy. It's fascinating. Ever the dispassionate analyst, Yergin treats highly controversial issues with a simple, fact-based approach. However, despite its ill treatment by much of the oil industry, he takes on the issue of global climate change in detail and with dead seriousness, leaving little doubt that the more rational leaders in the energy sector have no question about the potential world-changing effects of rising global temperatures. But Daniel Yergin is no pessimist. Tackling the issue of "peak oil," for example, he says, "the world is clearly not running out of oil. Far from it. The estimates for the world's total stock of oil keep growing." A massive overarching summary of the history of everything energy related. Seriously, it covers an absolutely enormous amount. It was published in 2011, and renewables have changed so quickly since then that some parts are already badly out of date, and the Chinese obsession with coal has reduced slightly since it was published also (although it's largely been transferred to developing countries by Chinese companies instead). Fascinating, although it covered a lot of ground of things I already kn A massive overarching summary of the history of everything energy related. Seriously, it covers an absolutely enormous amount. It was published in 2011, and renewables have changed so quickly since then that some parts are already badly out of date, and the Chinese obsession with coal has reduced slightly since it was published also (although it's largely been transferred to developing countries by Chinese companies instead). A bird's-eye survey of today's world of energy. Most of the discussion is centered on oil, which is Yergin's specialty. The world seems to have used up 1 trillion barrels of the stuff since the modern oil industry appeared in the late 19th century; there are 4 more to go. Much of the oil is hard to obtain: in Canada and Venezuela it is mixed with sand; off the shore of Brazil, it is under 2 kilometers of water and 5 kilometers of salt. Yet Yergin is dismissive of peak oil theorists: each decade, A bird's-eye survey of today's world of energy. Most of the discussion is centered on oil, which is Yergin's specialty. The world seems to have used up 1 trillion barrels of the stuff since the modern oil industry appeared in the late 19th century; there are 4 more to go. Much of the oil is hard to obtain: in Canada and Venezuela it is mixed with sand; off the shore of Brazil, it is under 2 kilometers of water and 5 kilometers of salt. Yet Yergin is dismissive of peak oil theorists: each decade, new technologies have appeared to both discover new oil fields and extract more oil from the already discovered ones, and this innovation does not seem to be ending. There is also natural gas, which is mostly used for heating and not transportation; it is liquefied at the well, transported in tankers, and converted back to gas on arrival; a field under the Persian Gulf between Qatar and Iran has a quadrillion cubic feet of the stuff. Improvements in hydraulic fracturing technologies have led to a boom in natural gas in the United States. Yergin thinks that on the whole, this technique is safe for the environment; others are not so sure. The 2008 spike of oil prices was caused by an increase of Chinese demand for oil; problems with supply in Nigeria (where insurgents attacked foreign-owned oil platforms); shortages of petroleum engineers, geologists, and materials necessary to build new oil platforms. Yergin gives "financialization" as another cause, but does not give a convincing explanation of how contracts to buy and sell oil at a given price in the future affect its price in the present. As I understand it, the author was an academic who earned his Ph.D. in International Relations at Cambridge. Based on his academic work, he wrote a Pulitzer prize winning book titled 'The Prize' in 1990, which was about the global oil industry and its effect on global economics and politics. This book (The Quest) picks up where 'The Prize' left off. It also goes beyond oil to incorporate every other major and minor form of energy, both renewable and non-renewable. Tying all of that in to the evo As I understand it, the author was an academic who earned his Ph.D. in International Relations at Cambridge. Based on his academic work, he wrote a Pulitzer prize winning book titled 'The Prize' in 1990, which was about the global oil industry and its effect on global economics and politics. This book (The Quest) picks up where 'The Prize' left off. It also goes beyond oil to incorporate every other major and minor form of energy, both renewable and non-renewable. Tying all of that in to the evolution of global economics and politics during the last few decades is no easy task, but I can't imagine anyone could have done it better. The book is very informative, very educational, very comprehensive, and could serve as the text for a very interesting course on the topic. So much has happened in the last few decades that makes for interesting subject matter. Wars in the middle east, the Arab spring, the advent of fracking, the rise of renewables, the electric car, etc. All of these events are discussed in the book in the context of the big picture that includes energy, politics, and economics. The first lesson I took away from this is that nothing happens in a vacuum. It is a bit scary how much the global economy is built on energy of one form or another. For me, I can honestly say this book was dense and it took me a long time to complete. In true academic style, it is full of references and footnotes for each chapter. But it was not dry, and the author did make efforts to follow a narrative through each chapter so that it at least had some flow. I did find it enjoyable to read. I thought the author did a great job of telling the story of Edison and Tesla, DC vs. AC, and how those event shaped our present. Similarly, the author did well to incorporate many other histories that are less well-known, but equally relevant to the current state of various energy sources. In this gripping account of the quest for the energy that our world needs, Daniel Yergin continues the riveting story begun in his Pulitzer Prize-winning book, The Prize. A master storyteller as well as a leading energy expert, Yergin shows us how energy is an engine of global political and economic change. It is a story that spans the energies on which our civilization has been built and the new energies that are competing to replace them. From the jammed streets of Beijing to the shores of the Caspian Sea, from the conflicts in the Mideast to Capitol Hill and Silicon Valley, Yergin takes us into the decisions that are shaping our future. The drama of oil - the struggle for access, the battle for control, the insecurity of supply, the consequences of use, its impact on the global economy, and the geopolitics that dominate it - continues to profoundly affect our world. Yergin tells the inside stories of the oil market and the surge in oil prices, the race to control the resources of the former Soviet empire, and the massive mergers that transformed the landscape of world oil. He tackles the toughest questions: Will we run out of oil? Are China and the United States destined to come into conflict over oil? How will a turbulent Middle East affect the future of oil supply? This book is vast- in the sense of both the timeline where the narrative is set and the breadth of topics covered. It really gives a feeling of what it takes to run the world. The author is a great storyteller. There were only one or two instances where I felt a little drag in the writing, which is actually great considering the size of the book. There was so much to learn and some of the stories of the people and institutions involved in "the quest" are downright fascinating-the chapters on Chi This book is vast- in the sense of both the timeline where the narrative is set and the breadth of topics covered. It really gives a feeling of what it takes to run the world. The author is a great storyteller. There were only one or two instances where I felt a little drag in the writing, which is actually great considering the size of the book. There was so much to learn and some of the stories of the people and institutions involved in "the quest" are downright fascinating-the chapters on China's rise, the oil-politics in the Caspian sea, the development of nuclear power and the rise of the world automotive market to name a few. A tour through the history of energy from oil, to natural gas, to nuclear, to climate change, and renewables. If you want an overview of global energy, how it works, and where it might be headed this is a good read. It is not sensational and does not demonize any one method of approaching energy but clearly lays out the pros and cons of each method and the history leading up to their development and integration. Very informative, comprehensive view of energy and the challenges facing various industries. A bit verbose at times, but still a good overview. Timely book that describes the current energy market/technology/political trends opportunities and obstacles, and where they might lead. Anybody interested or working in energy should read this. No one can doubt Daniel Yergin’s ability to bring together seemingly disparate phenomena in order to create sweeping narratives. In the case of the Quest, readers can’t help but compare it to its Pulitzer Prize winning predecessor, the Prize, and in that comparison it falls short for two reasons: First, Yergin’s strong suit is oil and gas, which becomes apparent in the final sections of the Quest. Second, and perhaps this happens to all award winning authors who loom so large in their field, but No one can doubt Daniel Yergin’s ability to bring together seemingly disparate phenomena in order to create sweeping narratives. In the case of the Quest, readers can’t help but compare it to its Pulitzer Prize winning predecessor, the Prize, and in that comparison it falls short for two reasons: First, Yergin’s strong suit is oil and gas, which becomes apparent in the final sections of the Quest. Second, and perhaps this happens to all award winning authors who loom so large in their field, but the Quest could have used a more ruthless editor to keep Yergin’s narrative in check and help consolidate a few subsections with names like “Game Changer” that reach only two to three paragraphs in length. Nevertheless, this is the best book I’ve found to date for an update on global energy markets from the fall of the Soviet Union to the Arab Spring and the Fukushima nuclear disaster in 2011. Beginning right where The Prize left off, Yergin traces the consolidation of the post-Soviet oil and gas industry, particularly the emergence of Rosneft as a major world player and the geopolitical impacts of that consolidation across the globe, not the least of which is the re-emergence of Vladimir Putin’s Russia as a major disruptive force among the western democracies. Where Yergin truly shines is when he shifts from the 30,000 ft view to the street level, and when he does this well the full implications of the butterfly effect knock you over. One of my favorite instances of this narrative technique in the Quest occurs in chapter 4, when he zooms in on the 1998 Bangkok real estate crash and explains how it rocked global oil markets, ultimately forcing the major oil producers such as Exxon and Mobile, Chevron and Texaco, Conoco and Phillips, Total and Petrofina to consolidate or die. Another great example of this technique occurs in Section 2, when he focuses on the story of George Mitchell and his engineering team in the Barnett Shale of north central Texas (and my birthplace). By tracing an obscure federal production subsidy from the Reagan era through a decade of trial and error by one very determined wildcatter, Yergin masterfully retells the now well-known story of the origins of the hydraulic fracturing boom in the United States. There are many such examples of this technique throughout the book and I would encourage anyone who wants to learn more about the 20 year history of oil and gas from 1991 to 2011 to read the first three sections of the book. However, by the fourth section, which is admittedly still very good, the grand narrative started to unravel for me and I was disappointed that he ultimately chose to go in this direction. As someone who is passionate about the development of renewable energy and distributed generation, I felt like Yergin wasn’t the right author to tell that story. Without belaboring the point, it becomes clear that Yergin goes from undisputed expert and insider in the first sections, which concern oil, gas, and power markets, to someone looking in from the outside in the later sections, which largely concern climate change, renewable energy, and electric cars. I completely understand why he structured The Quest this way though, which is why I still gave the book 4 stars. Writing in 2012, Yergin explains in the introduction that he wanted to continue the narrative from the Prize and explain why the Fukushima Daiichi nuclear disaster and the Arab Spring where such critical events in the history of global energy markets. In many ways, he was correct. The Syrian civil war, the ongoing chaos in Iraq, and the flood of refugees into Europe are THE geopolitical story of our decade. Conversely, political opposition to nuclear energy, the cleanest, gigawatt-scale, low-carbon fuel source yet developed, seems to fly in the face of the recently signed Paris Climate Agreement and global commitments to low carbon power generation which began in Rio in 1992. However, the pace of events in 2011 forced Yergin to end the story of our 21st century fuel sources not with an exclamation point like the Kuwait War, which served as the conclusion to the Prize, but with unfinished narratives such as the electric car and biofuels. The sequel of "The Prize", which focuses on the history of oil. The author deals in "The Quest" with the short period about oil that was left uncovered in the "The Prize", starting from the second Gulf War (invasion of Kuwait). In the meanwhile, oil has further dominated world politics: Chavez, Saddam Hussein, Nigeria and Iran. Next to that, the oil industry got involved in several mergers & acquisitions: Conocco Phillips, BP Amoco, Exxon Mobil and Total Elf to name a few. Contrary to Fukuyam The sequel of "The Prize", which focuses on the history of oil. The author deals in "The Quest" with the short period about oil that was left uncovered in the "The Prize", starting from the second Gulf War (invasion of Kuwait). In the meanwhile, oil has further dominated world politics: Chavez, Saddam Hussein, Nigeria and Iran. Next to that, the oil industry got involved in several mergers & acquisitions: Conocco Phillips, BP Amoco, Exxon Mobil and Total Elf to name a few. Contrary to Fukuyama's illusion, China and USA have been working further on their goal to be energy independent. The latter seems to be harder than expected, although coal and nuclear energy benefit China, shale gas and shale oil favor USA, energy conservation both. There is still a long way to go, but the growing non-OPEC share leaves opportunities for geopolitical diversification. What about Japan and Europe? Notwithstanding the Fukushima tragedy, the country has little more options than nuclear energy (taking into account a 80% import dependency on Middle Eastern oil). The same goes for Europe. It is OK to think green, but eliminating nuclear energy leaves no European option than to heavily rely on Arab oil. What if the US decides to retreat from that area? Europe lacks both the political courage and military means to protect its energy sources. - It was revealing to read about how everyone can get it wrong. The chapter detailing the speculation around the permanence of high oil prices, hopefully, will be an enduring lesson to me to be mindful that consensus opinion can get caught up disastrously in a mistaken confirmation loop. - Made me feel really admiringly towards those in the sciences and in industry working to find the answers to our energy and environmental needs. - Makes me simultaneously somewhat hopeful about the possibility of gradual but transformative progress in energy technology, but also a bit worringly aware that renewables are quite a small part of our energy mix. Energy debates in the U.S. public policy are focused around independence and oil. Yergin details the development, production, history and economics of the various energy resources that are used right now and the potential of those in development. Why I started this book: It's been on the Army's recommended reading list for a while and I found an audio copy. Why I finished it: Exhaustively researched, I was amazed to learn that this is the 5th time that we have been at the brink of running out of o Energy debates in the U.S. public policy are focused around independence and oil. Yergin details the development, production, history and economics of the various energy resources that are used right now and the potential of those in development. This is a monumental tour of the economical, political and technical history of energy and oil. Daniel Yergin is one of the world’s premier energy policy experts. After being a lecturer at Harvard he in 1984 co-founded Cambridge Energy Research Associates that in 2004 was acquired by IHS, of which he’s now Vice Chairman. His 1991 bestseller The Price: The Epic Quest for Oil, Money and Power was turned into a TV-series seen by more than 20 million viewers. The Quest is in many ways a sequel to Th This is a monumental tour of the economical, political and technical history of energy and oil. Daniel Yergin is one of the world’s premier energy policy experts. After being a lecturer at Harvard he in 1984 co-founded Cambridge Energy Research Associates that in 2004 was acquired by IHS, of which he’s now Vice Chairman. His 1991 bestseller The Price: The Epic Quest for Oil, Money and Power was turned into a TV-series seen by more than 20 million viewers. The Quest is in many ways a sequel to The Price. In his review of a vast array of energy related topics the author never really argues a thesis but is more descriptive. However, it’s pretty clear that he’s not an advocate of peak oil theories, as generally formulated. The book covers a lot of ground, not only is the history and politics of oil covered in full but also most other energy sources, plus Yergin gives a tour of electric utilities and automotives. There are six sections to The Quest; first a run-through of the geopolitical history of oil in all corners of the world but focusing on Russia and the former Soviet countries, on the Middle East and China, then a discussion on energy security and the diversification of supply. Thirdly, an account of electricity and how the electric utilities came to be what they are today is presented, next the author turns to the history of climate research that naturally extends to a section on renewable energy sources and to finish of a text on the history of vehicles ending with Tesla and Elon Musk. Every section is in itself divided into a mass of smaller chapters (35 in total and of quite varying length) which often follow a structure where a number of recent facts are presented on a topic setting the stage. Then Yergin goes back to the beginnings of what’s being discussed only to work his way through history to give the background to the initial situation. It’s a true privilege to be guided through the geopolitics of oil and gas by such an expert. The author is extremely well researched. As a reader you feel at times that Yergin must have been present at the negotiating table, at the oil discovery or in the lab inventing a technology only to realize that what he describes happened a hundred years ago or so. The writing is elegant, fluid and the text filled with interesting trivia as well as important facts. The section on climate research is popular science history writing of the best kind á la Bill Bryson’s A Short History of Nearly Everything (this is the best section together with the first one). As much as anything I’m through the book struck by the tension between sudden and large shifts in the relative pricing of various energy sources, the on- and-off nature of public subsidies, taxes and support and the need to make investments with very long time horizons. It’s impressive to keep the reader’s interest for a massive 725 pages but at times Yergin goes to far. Just because venture capitalists amongst other things invest in “CleanTech” doesn’t mean that the full history of the VC-industry has to be described, just because it was Albert Einstein who first explained the photovoltaic effect that provides the basis for solar panels it doesn’t mean that the author has to disclose an amount of details on the upbringing of the great physicist and so on. The author brings together all you knew about the history of oil and a lot you didn’t know to a coherent whole. Oil and energy impacts most of what goes on in the world and there are few sectors harboring equally powerful political interests. In the ending paragraph the author puts his faith in technological innovation: For that resource – creativity – will be critical for meeting the challenges and assuring the security and sustainability of the energy for a prosperous, growing world. This is the book to read for a primer on the energy question. It reviews the status of both conventional (oil, gas, coal) and unconventional (nuclear, wind, solar, geothermal, biomass) as well. The brief of the book is so huge that it sometimes seems unfocused as the author jumps between geographies, industries and chronology. But he gives an excellent composite picture of what the future of energy will be like. We probably won't run out of energy anytime soon. Shale gas, fracking and offshore a This is the book to read for a primer on the energy question. It reviews the status of both conventional (oil, gas, coal) and unconventional (nuclear, wind, solar, geothermal, biomass) as well. The brief of the book is so huge that it sometimes seems unfocused as the author jumps between geographies, industries and chronology. But he gives an excellent composite picture of what the future of energy will be like. We probably won't run out of energy anytime soon. Shale gas, fracking and offshore are already taking care of this. But how this will affect our environment as the billions from China, India, Nigeria and Brazil climb up the income scale and decide they like cars and air conditioning, is fairly easy to anticipate. It won't be good. I was surprised that global warming due to carbon emissions has been on the books for decades. This story about it being an issue where several views are possible is a willful misrepresentation by interest parties (the oil companies and their mouthpieces). A key takeaway from the book is the role of chance in choices that affected the long-term structure of our reality. Ford began his career working for Thomas Alva Edison in his Detroit company. Ford believed for a long time that automobiles should be electric. Only much later did he turn to the German Otto's combustion engine and came up with the idea for the T-Model. If he and Edison had been able to come up with a better, longer-lasting, non-leaking battery, cars today very likely would be electric. And then most cars in the US ran on alcohol rather than gasoline. However in 1919 came prohibition and this destroyed the market for alcohol derived from crops. So the industry shifted to gasoline. Low oil prices in the late nineties destroyed the social compact of the quintessential petrostate, Venezuela, and helped push Colonel Chaves to the Presidency. Then Katrina and he Iraq war pushed oil prices up to the stratosphere and allowed Chaves to remain in power until his death, thus ensuring that under his successor the country would edge closer and closer to meltdown. كان الكاتب الأمريكي دايننال يرغن قد أصدر سنة 1991 كتابه "الجائزة" (The Prize) ونال به شهرة كبيرة وأكد مكانته كأفضل مؤرخ للنفط من نواحيه الإقتصادية والجيوستراتيجية. وقد روى الكتاب، الذي تحول أيضا إلى وثائقي شهير، تاريخ أول إكتشافات للنفط وكيف غير حياة البشر وأصبح أهم سلعة تتنافس عليها الدول في القرن العشرين. كتاب "المسعى" (The Quest) صدر سنة 2011 ويحاول أن يكون تكملة للكتاب "الجائزة". يبدأ يرغن حيث توقف في كتاب "الجائزة" من حرب تحرير الكويت. ثم يسرد مجموعة الأحداث التي تسببت في تدهور الأسعار في عشرية التسعينات. وما يستوقف أكثر من أي شيء هو هول عملية النهب للمقدراته النفطية من طرف الأوليغارشية التي تكونت اثر انهيار الإتحاد السوفياتي، وتشابك المصالح الجيوستراتيجية التي أثرت في مسارات أنابيب النفط من الحقول الجديدة في في آسيا الوسطى والقديمة في بحيرة القزوين. يفسر بعد ذلك يرغن بالتفصيل جميع الأحداث التي تسببت تراكمها تدريجيا في تناقص المعروض منذ سنة 2000 وكان أكثرها إثارة سعي الصين المحموم لإيجاد مصادر للطاقة تدعم نموها اقتصادي الخرافي وتداعيات صعود تشافيز للسلطة في فينيزويلا. على عكس كتابه السابق الذي يفيض بالتفاصيل عن النفط فإن هذا الكتاب العملاق يعالج بشكل منهجي جميع القضايا المتعلقة بتاريخ ومستقبل تنمية واستغلال وتخزين ونقل وتأمين مصادر الطاقة الأخرى: الغاز الطبيعي والفحم والطاقة النووية والكهرباء والطاقات المتجددة. وفي هذه الأبواب تشد الإنتباه بعض القضايا مثل بدايات انتشار الشبكات الكهربائية وأهمية وضع التشريعات المناسبة لانتشارها باعتبارها نوعا فريدا من الإستثمارات، واستحداث تقنية تسييل الغاز وارتباطها باكتشاف الغاز الطبيعي في قطر وتتويجه مصدرا أساسيا لإنتاج الكهرباء، والتقنيات الجديدة لاستغلال النفط والغاز الصخري والرملي ودورهما في قلب موازين القوى بين السعودية والولايات المتحدة. وإضافة إلى تطرقه إلى كل تطور تكنولوجي هام، فإن أحد أهم الأبواب في الكتاب هو ذلك الذي خصصه يرغن يصف بالتفصيل تطور فهم العلماء لخطر غازات الاحتباس الحراري المسببة لتغير المناخ وسعي شركات الطاقة ومجموعات الضغط وبعض السياسيين اليمينيين إلى التشكيك في تلك الحقائق العلمية. I'll say it was a good book, very comprehensive and wide-ranging (something like 717 pages). It covered everything from picking up on oil-industry politics where The Prize left off (1992 - the present), a big focus on the history of climate change science and policies around it, and the history and prospects for renewable energies. It was not as focused as The Prize, though I can see that being difficult as The Prize was a straight history covering a specific topic: oil, where is this was more broad. And I appreciated the attention to climate and renewables, a key interest of mine. However, there were things I found unfavorable, and not just in comparison to his earlier works. For one thing, I am not sure this book was properly edited. I found myself wondering if he meant to say a sentence a certain way, then found some odd punctuation errors, weird capitalizations, etc. Finally I did a google search on The Quest and Copyedit and found I was not the only one noticing this. So ok, its a first edition, I think he may have rushed to print to keep things topical (he had the Fukushima nuclear disaster, for instance). And its a long book, really long. But still, come on. You pay people for this. But beyond that, I was struck by the the Republican slant to this. In The Prize (comparing again) there was straight up geopolitical analysis on the lust for oil, not just for countries' own sake but for the purpose of exercising control over others. He strongly makes the case that oil was paramount to British naval victories in WWI and in fact the Allies' overall victory, quoting Georges Cleamencu (I am paraphrasing instead of googling this) that the Allies rode to victory "upon a wave of oil." He connects the attack on Pearl Harbor to oil (the Japanese had none of their own and were reliant on the U.S. When the U.S. cut off oil exports to Japan, they decided they needed to take the Dutch East Indies, which could fulfill their needs. The only thing standing in the way: the US Pacific Fleet.) And he very clearly and eye-openingly describes the straight up power politics of US post-war planning that had its eyes squarely on dominating the Middle East for the purposes of its oil; "the greatest single prize in all of human history." It was understood that controlling the oil of this region would give the US a "veto power" over industrial rivals in the Western Europe and Asia (my college self reading this was pleased to see the overlap between Chomsky and Yergin.) It was clear oil was a dominant interest, for straight power politics, in the power war period, and closely connected to everything the US did in the Middle East, from supporting Israel as a proxy power to removing Saddam Huessein from his occupation of Kuwait. Iraq was an oil country. Its only export was oil. It was a nation defined by oil, and as such was a country of great significance to the global energy markets. But the ensuing war was not about oil. This was not a quote out of context. He goes on to make the case that it was about the perceived threat of WMD. He also goes through this chapter, and many others, attacking strawmen "Some people say this, but the truth is this. "But back to Iraq. Not about oil? At all? This I could see from a variety of historians who have colored perspectives, but the preeminent American oil historian? The author of The Prize? There is a way of saying the invasion of Iraq had something to do with oil, without saying it was a naken act of aggression in order to gain control of Iraq's resources and make it a dependent client state. You could take the Alan Greenspan line, who said it was somewhat about oil as we could not let this terrible person Saddam Huessein control all this oil, or something like that. But nothing? This echos Rumsfeld's declaration pre-war that the interest in Iraq had nothing at all to do with oil. Just nothing! At all! Their main export could be potatoes and it would be the same thing. I won't get into details as to why I think this is clear nonsense, but I will say that I think its clear nonsense, and disappointing. It reminds me of Henry Kissinger's book Diplomacy. Kissinger subscribes to the realist theory in International Relations (which I do as well) and goes through history looking at case studies in the exercise of real politick, showing how all nations act not out of good will but in their own interest; seeking to preserve and grow their own power. We look at Cardinal Richeleu masterminding France's actions in the 30 Year War, the Congress of Europe after the Napoleonic Wars, Germany's maneuvering post-WWI and post-WWII. It was fascinating and showed that, yes of course countries act only in the interests of enhancing their own power. There are no friends, just interests. The strong do as they can, the weak suffer as they must. Except...the US in Vietnam. Which suddenly Kissinger goes off track and describes it as a kind of war of nobility and altruism, nothing to do with US power interests at all. So yes, I can see why Kissinger has this inconsistency with Vietnam, given his participation in its execution. And the war crimes. And I can see Yergin's deciding to give this b.s. on Iraq. After all, its more recent and relevant than much of what he did in The Prize; and Yergin runs a likely very lucrative energy consultancy organization, so probably seeks to remain favorable in the industry. As Upton Sinclair said, it is difficult to get a man to understand something when his paycheck depends on his not. But, nevertheless, this made the book sour. He made a poor argument, even if it was wrong. He also devotes a chapter to demonizing Hugo Chavez in a way you might find on some fluky conservative website. I am no fan of Hugo Chavez, but you dont see this sort of criticism with say, Saudi Arabia, which has an atrocious authoritarian government straight out of the Middle Ages. He also has another chapter demonizing Iran. Which is fine, Iran has an undemocratic government... but again so does Saudi Arabia. So does Jordan. So did Egypt. Actually so does Egypt. So what I am saying here is that for a good part of this book we see Yergin towing this sort of "official US enemies" line. And thats ok if he feels that way, but its not the kind of tripe I was looking for. This was a good couple hundred pages between all this. If I wanted that I could've picked up some neocon book, which is what all this aligns with. 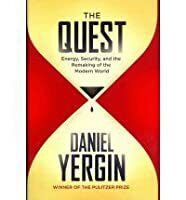 "The Quest" by "Daniel Yergin" provides an elaborate outlook of how the modern world has developed around their energy needs and how the energy security and new methods of energy development are the need of the hour. Energy trade, today, traverses national borders and energy security is not just about countering the wide variety of existing threats, it is also about the relations among nations, how they interact with each other and how energy impacts their overall national security. 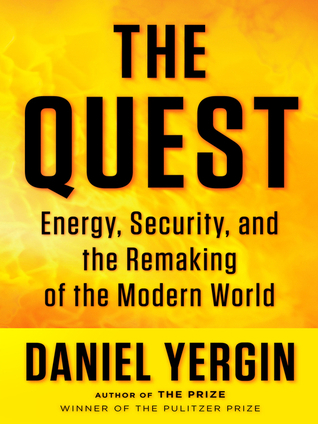 It is very i "The Quest" by "Daniel Yergin" provides an elaborate outlook of how the modern world has developed around their energy needs and how the energy security and new methods of energy development are the need of the hour. Energy trade, today, traverses national borders and energy security is not just about countering the wide variety of existing threats, it is also about the relations among nations, how they interact with each other and how energy impacts their overall national security. It is very important for people who aspire today to bring peace and peaceful solutions in the global society to understand about this concept and study. a) Physical Security: protecting the assets, infrastructure, supply chains and trade routes and making provision for quick replacements and substitution. b) Ability to develop and acquire energy supplies. c) It is also a system involving - national policies and international institutions that are designed to respond in a coordinated way to disruptions, dislocations and emergencies. a) the Military Coup in Venezuela against Hugo Chavez which led to temporary disruptions in PDVSA (an oil company), which used to supply a large quantity of oil to USA. b) Nigeria, also supplied a large quantity of oil to USA but due to ethnic differences in the country, groups like Bakassi Boys came up and activities such as illegal trading of oil and fuels began. Almost 40% of the oil produced in Nigeria was stolen and lost in the world market. c) Hurricanes Rita and Katrina which destroyed the offshore oil production setup in Gulf of Mexico. and many other such examples are there. With the breaking of Soviet Union into 15 countries, Russia was going through a crisis. Private Oil companies such as Yukos, Lukoil, Surgot were there in Russia. These private oil companies were ruling the Russian Politics internally until the coming of Vladmir Putin. Vladmir Putin showed an Iron hand to these companies especially to Mikhail Khodorkovsky who was the head of Yukos. Yukos was one of the most profitable oil company of Russia and Putin wanted to make it national company. Mikhail Khodorkovsky wanted to sell Yukos and transform Russia into a parliamentary form of government than the presidential form of government. He wanted to take the position of Prime Minister for himself. Mikhail was imprisoned on charges of due tax payment and Yukos was dismantled and turned into Rosneft, which became a national oil company. Baku, a place in Azerbaijan, near Caspian sea had huge reserves of oil. In September 1994, the deal of century was signed, where the six countries( later changed to seven, when a Japanese company joined) signed to get the Azerbaijani oil to the world. But the question was through which route, would the pipeline by which the oil would be carried to the world, be created. The northern route, through Russia was not acceptable to many countries, as that route would have given complete monopoly to Russia. The second route was through the east, through Georgia, which was not acceptable to Russia as its terms with Georgia were not very amicable. It was proposed to create pipeline through both the routes. Finally, the pipeline was set through a new route which was called the Baku-Tbilisi-Ceyhan Pipeline. Asian financial crisis had generated enormous economic ruin. By implementing the Jakarta agreement, OPEC had been increasing its output, just when demand was falling. Thus, a new term was coined, "The Jakarta Syndrome" which referred to the danger of increasing production when demand was weakening or even just uncertain. "Supermajors" or Big Oil refers to the major oil producing companies of the world. They are: Chevron, British Petroleum, ExxonMobil Royal Dutch Shell, Total, with ConocoPhillips Company. Two state-owned Chinese oil companies, CNPC and Sinopec have major revenues but are not part of Supermajors. Other than oil dug from the traditional oil wells, there are few unconventional ways of getting oil. One such way is offshore oil digging. Another unconventional source of oil is Tight Oil, also known as "Shale Oil". Now, there is another factor that we need to keep in mind when studying about energy resources, environment. The greenhouse gases are depleting the ozone layer and leading to global warming. Also, resources such as oil and coal are fossil fuel which are developed over a large period of time. The world has started paying attention to this ecological crisis. Protocols like the Montreal Protocol and the United Nations Framework Convention on Climate Change(signed in Rio) are proof of human consideration on the rising ecological massacre. The purpose of such conventions is the stabilization of greenhouse gas concentrations in the atmosphere at a level that would prevent dangerous anthropogenic interference with a climate system. Today, renewable source of energy must be put into use such as solar power, hydro power, wind energy, bio fuel and tidal power. The problem with solar and wind power is that they are intermittent. With bio fuel that, the land might not be sufficient to produce crops for fuel. After all, food requirements are preferred over fuel requirements. Such renewable sources should be put into use. The age of electricity is approaching. Cars would soon run on electricity but the main issue with them is that the battery must be designed in such a way that they consume less power, and a longer distance could be covered in a single charge. Today prices of oil is at it lowest, People have started talking about other source of energy, I don't know if it was natural resource that is a problem or human greed. I wish peace always prevails. The Quest was a fantastic book with profound understanding of the oil business through history with the ecological and economic needs of today. I found this book an extremely valuable read, even though a few years have passed since its publication, and the energy market has changed a lot since. It still holds up. Highly recommended, both to laypersons, and to people in the industry who are seeking a perspective that encompasses the whole market and its history. At first I suspected the author of being a blind fan of unregulated capitalism, whose like sprout up so often in economic and entrepreneurial circles. However, by the middle of th I found this book an extremely valuable read, even though a few years have passed since its publication, and the energy market has changed a lot since. It still holds up. Highly recommended, both to laypersons, and to people in the industry who are seeking a perspective that encompasses the whole market and its history. At first I suspected the author of being a blind fan of unregulated capitalism, whose like sprout up so often in economic and entrepreneurial circles. However, by the middle of the book it became clear that Yergin is very much a sensible moderate, with a healthy respect both for free markets and for market regulations. There are examples throughout the book that show how both these elements are tools that can lead to great successes when implemented wisely, and to immense failures when implemented poorly. Yergin is very good about letting examples stand on their own, without shoehorning them into a narrative to prove personal opinions. O autor fala da exploração e expansão de fontes tradicionais, como carvão, petróleo (conventional x unconventional), gás (conventional x unconventional) e nuclear (uma das partes mais interessantes) + energias renováveis como biocombustíveis, nitrogênio, eólica, solar e o desenvolvimento das baterias. Não esquece ainda da questão geopolítica internacional, nacional e regional. Casos recentes envolvendo mega empresas, como a Exxon-Mobil, Chevron, BP e as estatais chineses, russas e a 'nossa' Petrobras. Não esquece de questões políticas de Bush, Putin, Margaret Thatcher, Obama e outros. Por que não dei 5 estrelas: achei o livro excelente, mas como ele aborda muitos temas, acaba ficando superficial nos assuntos. Já o livro"The Prize: The Epic Quest for Oil, Money & Power" focou somente na trajetória do petróleo, e não por acaso recebeu o prêmio Pulitzer em 1992. A VERY long read, but each section can be read independently. A must read for anyone working in the energy / oil & has industry, or for anyone with an interest in the inner workings of macro economic energy policy and major events and trends which have shaped our current energy landscape. Daniel Yergins storytelling skills make this topic read like an addictive crime novel. Some say you need to read his first book, The Prize, first. But I don't think this is the case. The Prize covers the ea A VERY long read, but each section can be read independently. A must read for anyone working in the energy / oil & has industry, or for anyone with an interest in the inner workings of macro economic energy policy and major events and trends which have shaped our current energy landscape. Daniel Yergins storytelling skills make this topic read like an addictive crime novel. Some say you need to read his first book, The Prize, first. But I don't think this is the case. The Prize covers the early stages of oil discovery up through the industrial revolution. The Prize picks up with the beginnings of the major events in the past generation which have formed the current global energy landscape, such as the emergence of Russia and China as oil and energy powers, and the boom of oil & gas discovery in the Caspian sea and surrounding middle eastern countries. He received the Pulitzer Prize for The Prize: the Epic Quest for Oil Money and Power, which became a number one New York Times best seller and has been translated into 17 languages. Dr. Yergin is Vice Chairman of IHS and Founder of Cambridge Energy Research Associates and serves as CNBC’s Global Energy Expert. Other books by Dr. Yergin include Commanding Heights: The Battle for the World Economy. Dr. Yergin has also written for The New York Times, Wall Street Journal, Washington Post, Financial Times, Foreign Affairs, Foreign Policy, The Atlantic, Los Angeles Times, International Herald Tribune, and many other publications. Both The Prize and Commanding Heights were made into award winning documentaries. The eight-hour miniseries The Prize was aired on PBS, BBC, and NHK and viewed by 20 million viewers in the United States alone. The 6-hour documentary Commanding Heights that Dr. Yergin produced received three Emmy nominations, and the New York Festivals Gold World Medal for best documentary. Dr. Yergin serves on the U.S. Secretary of Energy Advisory Board and chaired the US Department of Energy’s Task Force on Strategic Energy Research and Development. He is a Trustee of the Brookings Institution, on the Board of the New America Foundation, and on the Advisory Board of the Massachusetts Institute of Technology Energy Initiative.